For the purposes of this, the SHIFT button on your keyboard is the UP arrow on the bottom left. Hold down SHIFT and ALT at the same time, then press G.
Next, connect your Kindle to your computer via USB. On your pc, click Start then My Computer. A new drive will appear called Kindle. Click it open & click to the documents folder. In your documents folder, you'll find copies of all your books. You will be looking for files ending with .gif. To find them more easily, you could view by thumbnail (right click, view by, select thumbnail). You'll see some blank thumbnails for the books & mini images of your screenshots. You can now copy those to your My Documents folder or Desktop, save them in a file or print them out. (note that unless a book is public domain, you will not be allowed to use these for anything other than personal use). When you're done, you need to disconnect your Kindle. The easiest way is to go back to My Computer, right click the Kindle drive and click Eject or Remove. Then you can unplug the USB. 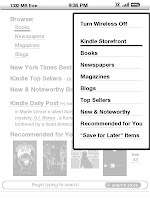 For Kindle Touch (just found this one): Hold the home button for 3 seconds or longer, then tap anywhere on the Kindle Touch’s screen, then release the home button.